The City of Calgary hosted Hackathon 2018 on May 26th and 27th. The focus of this year’s event was about improving pedestrian comfort in the City. 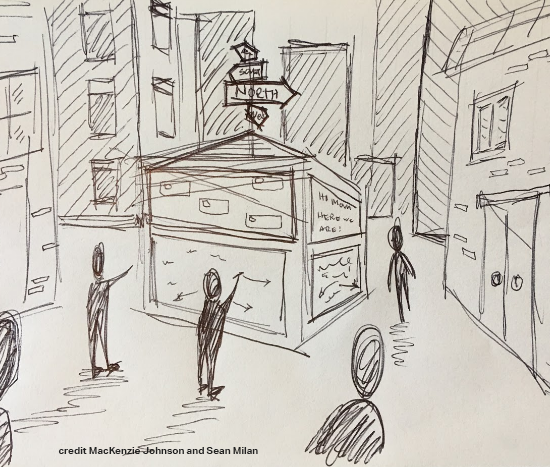 Lynn Machacek of our Calgary office participated for the first time with his team who developed the winning concept in the Play category “Create something that helps people use our streets in new ways and encourages community”. The winning idea encompassed an interactive wayfinding board that combined public art, a community bulletin board, and guerrilla wayfinding. The device would enable people to share their favourite walkable places nearby, and for visitors to learn about what was going on in the neighbourhood. The team’s prototype “Near Here” was tested on Stephen Avenue during the Hackathon. The concept generated lots of engagement from people who wanted to share ideas and from those who were looking for places to go. Exactly the outcome the team was looking for! The team is currently working with the City of Calgary to further develop and pilot the idea. If successful, future iterations could include more advanced wayfinding technologies and interactive social media components. The team consisted of Gabrielle Dickson, MacKenzie Johnson, Sarah Ali, Lynn Machacek, Sean Milan and Logan Krupa.